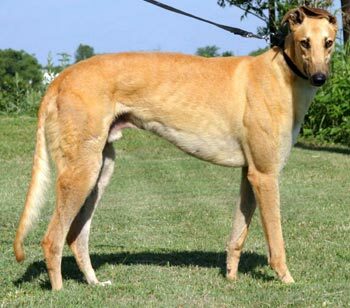 Harlyn, aka Pinny's Hot Rod, is a 6-year-old red male born December 13, 2005. 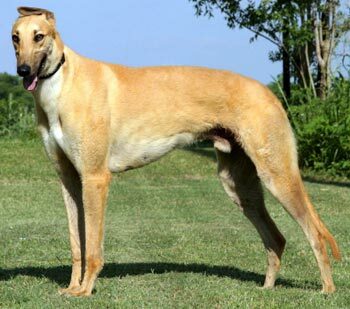 His sire is Stan's Boy Flyer, making his grand sire the famous Gable Dodge, and his dam is Rooftop Pinny (GALT's Pinny). Harlyn raced in only 3 races in Corpus Christi, Texas, beginning on December 6, 2007 and ending December 29, 2007. He is a large boy with a very sweet disposition and ears that can point in all directions. 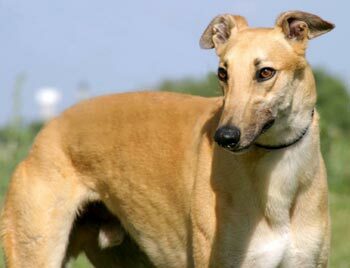 Harlyn was in a home for three years, but has returned to GALT due to a change in family circumstances. Harlyn and the cats: They say familiarity breeds contempt, and that seems to be true for Harlyn. After living peacefully with cats for a couple of weeks, he has now decided that they would make fun squeaky toys, and we have had to add him to the roster of "Team No-Cats,"